With winter temperatures dropping last night, it was the perfect opportunity to stay inside where it was warm, and watch “Meeting People Is Easy,” the 1998 rockumentary on Radiohead. It follows the lads around the globe as they tour extensively behind “OK Computer,” their breakout 1997 release. For those of us into progressive modern rock, it’s hard to identify a more significant album since “OK Computer.” Radiohead carries the torch left behind by Pink Floyd, and provides an intelligent mode of psychedelia. 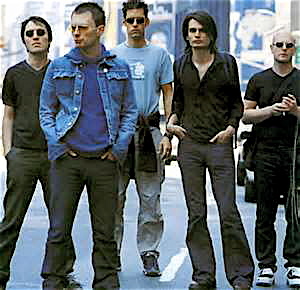 The band continues to make unique and important recordings, but “OK Computer” was the record that separated them from the pack. I caught a stop on this tour in 1998, when Radiohead played the Tibetan Freedom Concert in Washington, DC. Lots of good bands played this two-day festival, Beastie Boys, R.E.M., Red Hot Chili Peppers, Dave Matthews Band, Pearl Jam, but Radiohead was the only one that caught people by surprise. They sound deadly correct live, serious, and when singer Thom Yorke got his alien head-bob going and hit the high notes, everybody in RFK stopped their conversations and turned around to pay rapt attention to Radiohead. Nobody is going to mistake lead guitarist Jonny Greenwood, bassist Colin Greenwood, guitarist Ed O’Brien, drummer Philip Selway or vocalist Thom Yorke as a batch of carefree, happy-go-lucky blokes, but they are genuine. As such, “Meeting People Is Easy” isn’t your typical rock-n-roll film either. It’s not a concert, nor does it show any songs being played in their entirety. It’s more an abstract examination of how Radiohead moves through its tour, jumping in between Europe, Japan, and the United States. There are plane rides, that lead to buses, that lead to cars, that lead to trains. They are always going somewhere next. Flash bulbs explode at every stop, before, during and after shows. There is one telling scene when the director, Grant Gee, strings together numerous photo ops, so the camera flashes are going off from different shoots like rapid machine gun fire, but really they run together forming one long moment. That was Radiohead’s life. The modes of travel, interviews, idol worship and flash bulbs. 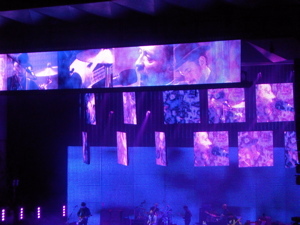 Radiohead on “The King of Limbs” tour in Cincinnati | 2012. “OK Computer” had skyrocketed. The CD was critically recognized as the best recording of 1997. It was ahead of its time, as is everything Radiohead has done. It took a couple years for its true impact to be realized, but the film catches the boys in the moment when they transform from being an opening band that does that “Creep” song, to becoming a headliner. Thom Yorke in particular recognized their lives had changed, forever. No longer could they pop down to the pub for a pint before a show. It was the curse of fame. There also is the obvious pressure. When Capitol Records first heard the finished version of “OK Computer” they downgraded its expected sales, deeming it uncommercial. 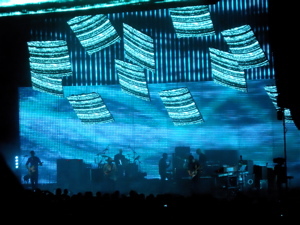 But for Radiohead, their focus quickly shifted from congratulatory, to recognizing they must craft a follow-up disc that meets or exceeds these new expectations. The problem for Radiohead is everyone wants to try and quantify them. What does their name mean; there is no song called “OK Computer,” so what is the title about; what inspired certain lyrics, etc. This isn’t the kind of band that is going to answer those questions. It’s like trying to get a straight response from Bob Dylan. These guys are above all that. Where the ideas come from, I don’t think they know. It just is, so it becomes painful to hear these questions from reporters. I can imagine fame might feel this way. One day you are still a regular person, the next it’s all interviews and private jets. You remain the same person inside, but suddenly you’ve been elevated above the masses and everything changed. Don’t get me wrong, I’m not feeling sorry for the rich rock stars. They chose this career, but this kind of pressure and lifestyle is exactly what led Kurt Cobain to kill himself, and many others to self-medicate with drugs. There is a level of alienation that comes with big-time rock and roll, and this film captures that. On one hand “Meeting People Is Easy” is just a video montage, but it also is an art film. Mostly shot in black and white, the shifting scenes together portray the grind of touring and the isolation felt by the members of Radiohead. Yorke: There’s a line in Karma Police about “he buzzes like a fridge.” You know when you’re driving around in America and you have the alternative stations on in the background or in your hotel room, and it’s just like a fridge buzzing. That’s all I’m hearing, I’m just hearing buzz. It’s really odd. It’s kind of funny though really. I have to laugh. Interviewer: that had the modern rock format was “Creep.” You first came in with that. Yorke: That’s good fridge buzz. The ironically titled “Meeting People Is Easy,” gives us an inside look at Radiohead as they ascend to superstardom, but fight against what they must give up to be famous. Here they are on this huge world tour, they play before thousands of people nightly and answer all these questions from reporters, but they meet no one. They cease to exist as merely people. Now it’s impossible to discern whether anybody likes them for who they are, or only wants to meet them because they are Radiohead. This creates a sense of paranoia, yet these guys are pros, and they find a space within the vortex of celebrity where they can create and survive. This entry was posted in Music, Reviews and tagged Radiohead. Bookmark the permalink.